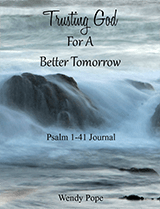 Wendy’s teachings walk you through Psalms 1-41. Wendy's videos make you feel as if you are right in her home studying together. The pace is not overwhelming and Wendy presents the lessons in digestible bit-sized pieces. TGFABT is perfect for the woman new to Bible study as well as the seasoned student. 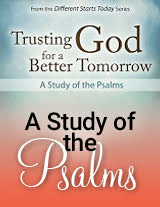 This study is perfect for group or individual study. Additional Supplies Needed: A Single Subject Spiral Notebook. Daily Journal for the Trusting God for a Better Tomorrow - Psalm 1-41. The journal includes daily prompts for each day of your study. How exciting!!! All you need in one place. Enjoy! 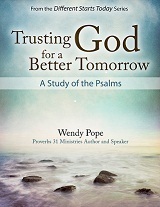 Wendy will walk you through Psalms 42-52, studying one Psalm per week. We have combined the Study Questions and Daily Journal for the Trusting God study in downloadable books. Each book has been created specifically for each study. How exciting!!! All you need in one place. Enjoy! 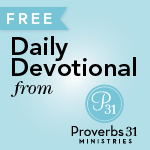 Wendy will walk you through Psalms 53-69, studying one Psalm per week. Wendy will walk you through Psalms 70-82, studying one Psalm per week.